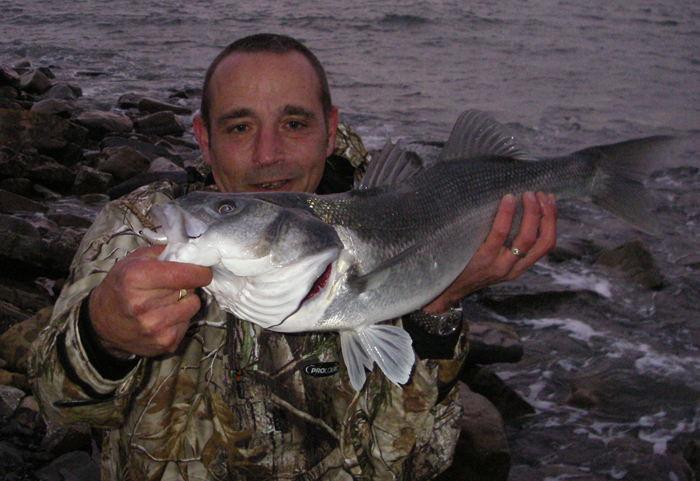 After my limited success with bass the other day I was quite keen to give it another go. So, when my pal Bill rang to say he was going to try the spot where I'd caught the fish and offered me a lift down I couldn't refuse. When we arrived at the shore there was a strong onshore wind blowing and the sky was overcast so even though sunset was an hour away it was already pretty gloomy. 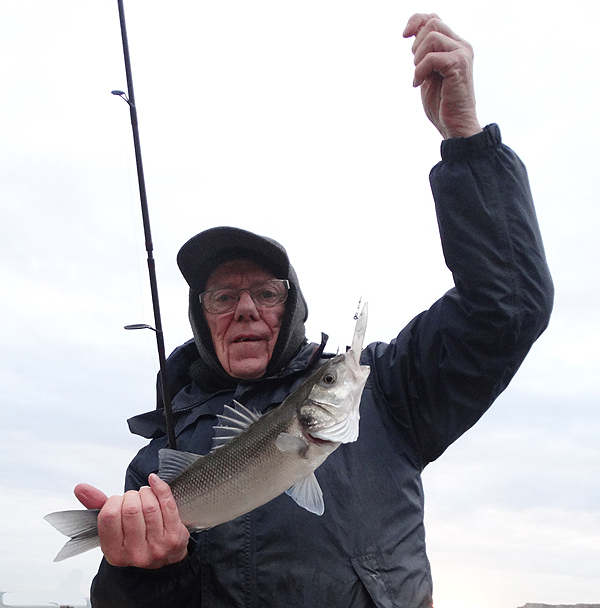 We were had both tackled up before leaving home, Bill had tied on Redgill's version of his favourite white, weedless, 'Slug-Gill' and I was using the same 18cm, Pearl, Evo-Redgill that I'd had on last time. We took up our positions a few metres apart and began to fish. 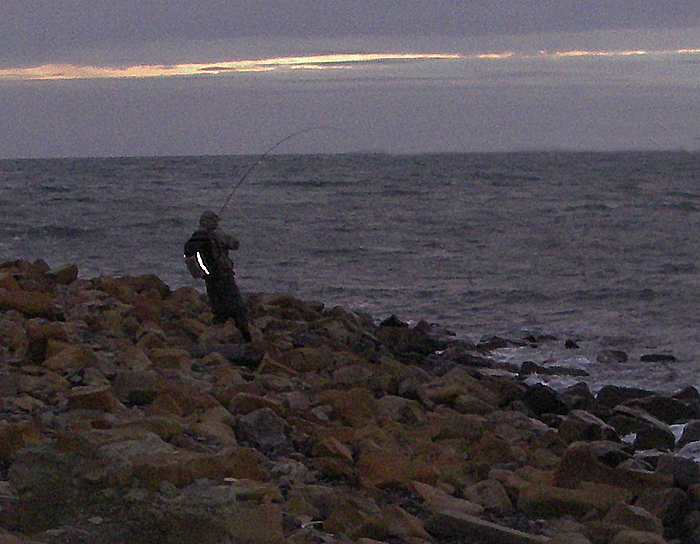 Despite the waves there wasn't too much loose weed in the water so it was pretty easy fishing apart from the effect of the stiff breeze on casting. On my third cast I had a fierce take and I was in. I called to Bill and saw him putting down the rod to pick up his camera. My bass was not huge but it was in good condition so after we'd landed it, briefly admired it and returned it we continued to fish. Shortly afterwards I had another bite which I missed. Half-an-hour passed and we moved fifty metres or so along the rocks to try another spot, I gave it ten minutes before returning to where I'd caught the fish but Bill hung on in the other place. Soon afterwards I heard a call and looked up to see my pal with the rod well bent. I grabbed the camera and tried to get a picture or two of him playing the fish as I walked towards him. By the time I reached Bill's stance he'd beached his bass - lovely 62cm fish which should have been about five pounds but I reckoned was well over that weight. 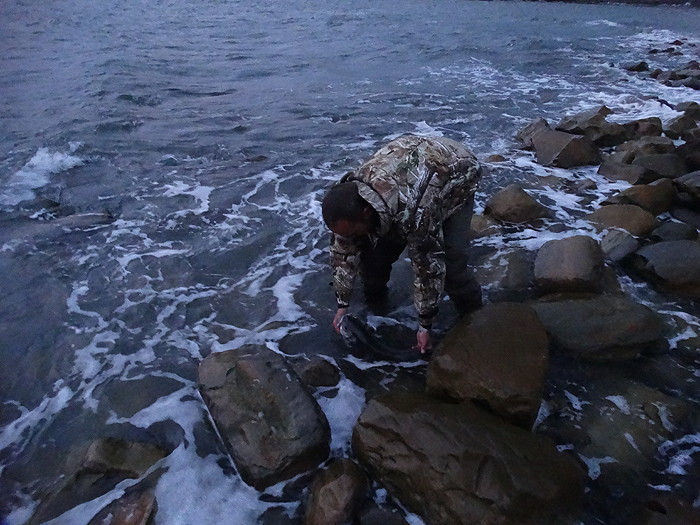 I took a few pictures as he was unhooking and returning the fish to the sea where it swam off strongly. We continued fishing for a while and each had another knock (both missed). Bill then got snagged in the rocks and lost his lure while was trying to smooth out my line which, for some reason, had piled up on one side of the spool. By now it was almost dark and an April shower was threatening so we packed in and went home. An hour well spent I'd say. My little fish had engulfed the lure. Sixty-two centimetres of cracking bass. Note the weedless Evostix lure. Back it goes - no worse for the experience.